I discovered this wonderful card sketch blog a couple of weeks ago called 2 Sketches 4 You, but I really haven't had a chance to do one of the weekly sketches, until today. I was very inspired by this sketch and I had a few moments and wanted to go and play with my scrapbooking stash, and this is what I came up with. 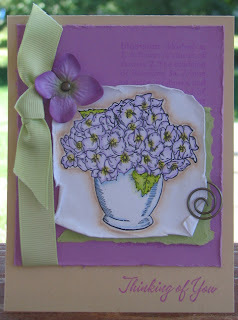 The cardstock, ribbon, stamps, metal accents are all from Stampin Up. The flower is Prima and I used my Prismacolor pencils and the Gamsol or Magic color pencil techinque to color in the stamp. Lovely card, the colours suit the sentiment.... TFS. What a beautiful, beautiful card, Amy! I love it!